Mountain bikes can scramble over roots and rocks that would stop a road bike in its tracks, but when it comes to pavement, a road bike will take the lead every time. This discrepancy in speed results from the weight of the bikes, the position of the riders and other basic differences in construction. In general, it takes more energy to propel a heavy mountain bike than it does a road bike. 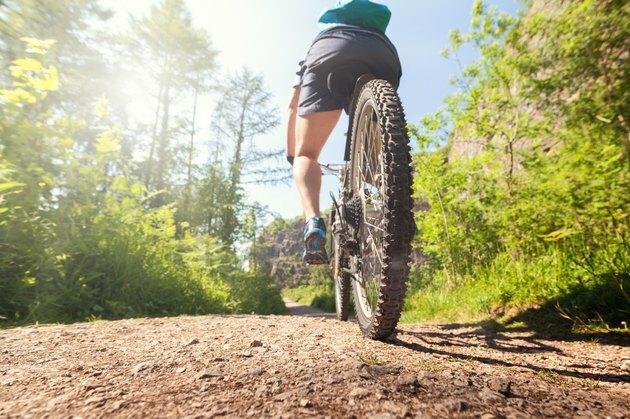 Thick, wide, heavy tires on mountain bikes are effective for getting you over rough terrain, but the added weight makes it harder to accelerate and slows the bike down. The soft, knobby tires on a mountain bike also increase rolling resistance and air resistance, which decrease the bike's speed. Road bike tires have higher air pressure and are much smoother, which enables them to accelerate quickly since there is less resistance between the tire and the road. Mountain bikes generally are made from heavier components than road bikes, which makes it harder for them to move forward. Sleek road bikes have no trouble accelerating, while mountain bike riders are stuck trying to propel more weight over the same distance. The frame, wheels, tires and other components all weigh more on mountain bikes. A road bike encourages its rider to sit crouched forward, while mountain bike riders sit in an upright position. This means a person riding a road bike is more aerodynamic, which enables acceleration. At high speeds, wind resistance can slow down a mountain biker. Mountain bikes frequently come equipped with suspension systems that give their owners a smoother ride. However, these systems absorb energy, which means pedaling effort that could be used to propel the bike forward is lost in the springs of the suspension. With the suspension locked, mountain bikes will have more speed, but not the protection when hitting unexpected bumps in the road. Mountain bikes have a lower low gear than road bikes, but they also have a lower high gear. This means that although a mountain bike has more power, it also has a lower top speed.